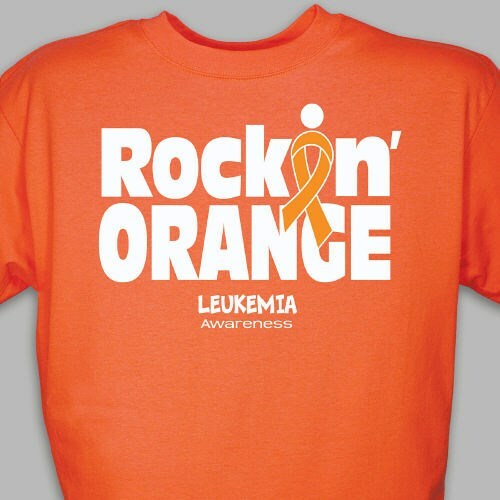 Support your loved one with this great Leukemia Awareness ""Rockin' Orange"" T-Shirt, whether it’s your Mother, Father, Sister, Brother, Friend or any loved one you want to support. With any Leukemia Awareness Walk Event, you along with family and friends can show your support and help raise awareness together. Our Leukemia Awareness Shirt is available on our premium 100% cotton t-shirt, machine washable in youth sizes XS-L and adult sizes S-3XL. Wear this Leukemia Awareness T-Shirt at your next awareness event! Additional Info By showing awareness, you will help support the fight for a cure. Take a look at our entire collection of Leukemia Awareness Apparel & Walk Gear to show your support today! You will also enjoy this great design as our Rockin' Orange for Leukemia Sweatshirt & our Leukemia Awareness Coffee Mug as well.